The Roller Cycle can be sold and shipped, either one or many, anywhere in the United States and Canada. However, if you want to purchase a Roller Cycle in the EU, you will have to ship the body in parts and the engine separately and you will be responsible for assembly. Users in the EU, we can help however, we can not honor the warranty, cover shipping if you fail to properly assemble the roller cycle. The Roller Cycle was not made for travel on roads and highways as laws differ from City to City , State to State, Province to Provence and country to country. 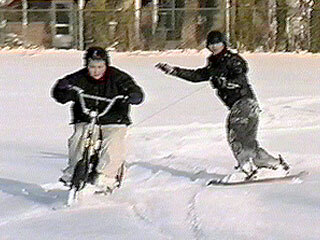 Therefore the Roller Cycle's use is intended for use on off road areas only as described in the safety video. We do acknowledge that people who buy the Roller Cycle chose to go against our recommendations. that, over which, we have no control. The Roller Cycle does require some technical skill to assemble and maintain a unit in good working order, not just for operation but safety. Some of the videos you see are done by Professionals as the Inventor hold a unique qualification in this catergory and team member aslo do spectacular things using the roller cycle. The Roller Cycle is made for intermediate to advanced skaters. It is essential that you can power slide on inline skates with complete control before you use the Roller Cycle. It is much easier on asphalt but grass, snow, dirt, etc does reuquire some expertise using the roller cycle. We suggest that you take it slow, make sure your safety kill switch is attached and learn the balance needed to use the roller cycle. 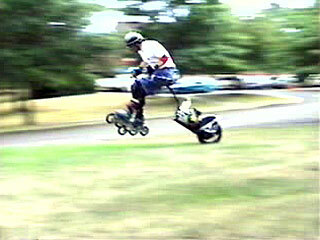 Roller Cycle is a perfect balance between man and machine. You must learn how to handle the roller cycle at slower speeds before you can successfully use the roller cycle at higher ones. 25 MPH is pretty fast on the Roller cycle and this is hardly an aid to skating. This is brutal exercise, which we will talk more in videos to come. We may soon have a large instructional video section about use and maintenance of the roller cycle. There is nothing like the Roller Cycle in the world that's the closest thing to putting on a jet pack a normal person can come. We encourage roller cycle users to post videos of their adventures. Properly maintained, your roller cycle will last you many years.